Transitional justice mechanisms employed in post-conflict and post-authoritarian contexts have largely focused upon individual violations of a narrow set of civil and political rights, as well as the provision of legal and quasi-legal remedies, such as truth commissions, amnesties and prosecutions. In contrast, this book highlights the significance of structural violence in producing and reproducing rights violations. The book further argues that, in order to remedy structural violations of human rights, there is a need to utilise a different toolkit from that typically employed in transitional justice contexts. 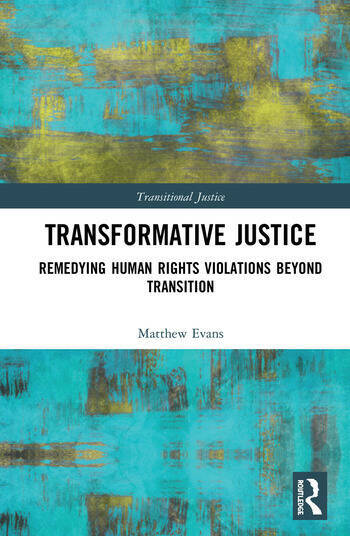 The book sets out and applies a definition of transformative justice as expanding upon, and providing an alternative to, transitional justice. Focusing on a comparative study of social movements, nongovernmental organisations and trade unions working on land and housing rights in South Africa, and their network relationships, the book argues that networks of this kind make an important contribution to processes advancing transformative justice. What kinds of ties already exist? What threats to and opportunities for more effective collaboration exist? Matthew Evans is a Teaching Fellow in Law, Politics and Sociology at the School of Law, Politics and Sociology, University of Sussex, Brighton, UK, and Visiting Researcher in Political Studies at the School of Social Sciences, University of the Witwatersrand, Johannesburg, South Africa.